The National Assembly elected a new speaker Friday as parties agreed earlier this week to normalize parliament after a more than 40-day legislative vacuum. 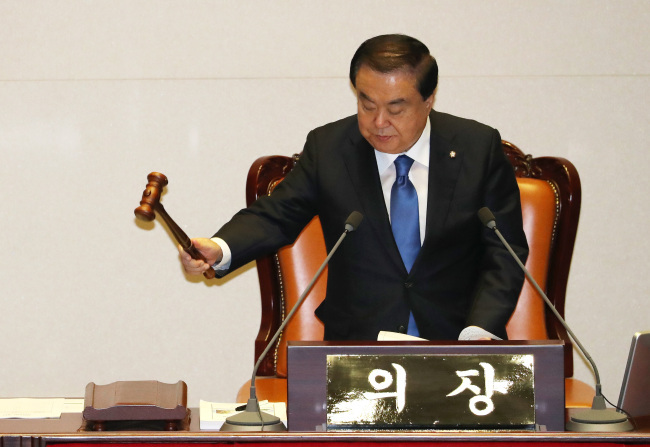 Lawmakers approved a proposal to elect Moon Hae-sang, a six-term lawmaker of the ruling Democratic Party (DP), as speaker for the second half of the 20th National Assembly's four-year term. They also voted in favor of Lee Ju-young of the main opposition Liberty Korea Party (LKP) and Joo Seung-yong of the minor opposition Bareunmirae Party as the two vice speakers. "We should not forget the grim reality that people will hand down judgment on lawmakers if they are only embroiled in confrontations and tensions and leave parliament in deadlock," the 73-year-old Moon said after the election. "What should be a priority is seeking cooperation among parties." On Tuesday, rival parties reached an agreement over the formation of parliament's new leadership and its 18 standing committees. The former speaker's two-year term ended in May, but the parties started consultations over the issue in late June as opposition parties were stung by their resounding defeat in the June 13 local elections. In accordance with custom, the ruling DP took the position of parliamentary speaker and the LKP and the BP, the second- and third-largest parties, got the vice speaker posts. Under the law, a parliamentary speaker and vice speakers are subject to approval from a majority of lawmakers. Under the deal reached Tuesday, DP members will chair eight committees, while the LKP and the BP will head seven and two panels, respectively. A joint negotiation bloc of two minor parties will lead one committee. Next Monday, the National Assembly will open a plenary session to elect the chairs of the standing committees. Also it will vote on a revised parliamentary bill to separate the committee on education, culture, sports and tourism into two panels -- one handling education and the other in charge of the remaining affairs. A pile of bills on policy issues and people's livelihoods is pending. Finance Minister Kim Dong-yeon met with Hong Young-pyo, the floor leader of the DP, on Thursday, asking for parliament cooperation to pass key bills on reforms to prop up the slowing economy. Job growth remained poor as the number of newly created positions stayed slightly above 100,000 per month for the fifth straight month in June, the worst job data since the 2008 global financial crisis. During a 14-day extraordinary session that kicked off Friday, confirmation hearings on the national police chief designate and three Supreme Court justice nominees will be held. The DP also plans to seek cooperation from opposition parties to buttress a joint declaration adopted after the inter-Korean summit in April through parliamentary ratification or a supportive resolution.